It’s Ruby’s elder birthday, an occasion which naturally calls for a party! Lilah is making her a Sugar Free Carob Coconut Cake – that sounds awful (maybe apart from the coconut), but I’m curious. Erica is the first guest to arrive, and she goes straight to her mom to congratulate her. Juanita arrives next, shortly followed by the twins and their… business associates. And last but not least, Cassiel and Baato make an entrance. Also… Ruby! Are you checking out Tony? Your husband is right there! Cassiel gives it a go. Unfortunately it doesn’t seem that it’s worked too well. Erica and Daniel seem completely oblivious of the drama around them. Also, the cake doesn’t look too bad! It’s time for the big twirl! I don’t think any of my birthday parties have seen this much confetti thrown at once! Welcome to elderhood Ruby! You’re still cute! Meanwhile, Isaac bonds with his first born grandson. It’s a lot later in the night by the time everyone leaves. Isaac and Ruby finally have some time on their own. Sorry, Meatballs. Isaac and Ruby are still going strong. Lolz. baato wouldn’t be baato if he wore a shirt. I love Erica and Daniel, they are so cute together. The party look amazing by the way! “Daniel: “Hi Isaac, I missed you. I love watching you sleep. You look so peaceful…”” hahahaha this chapter has been the most amusing of all I would say. So many weird sims in one place. Cassiel, the twins, the meatballs and Juanita. A typical party in the Bloomer family. But I like that the family is getting bigger and it looks like despite everything they had a good time. Emma: Thank you! 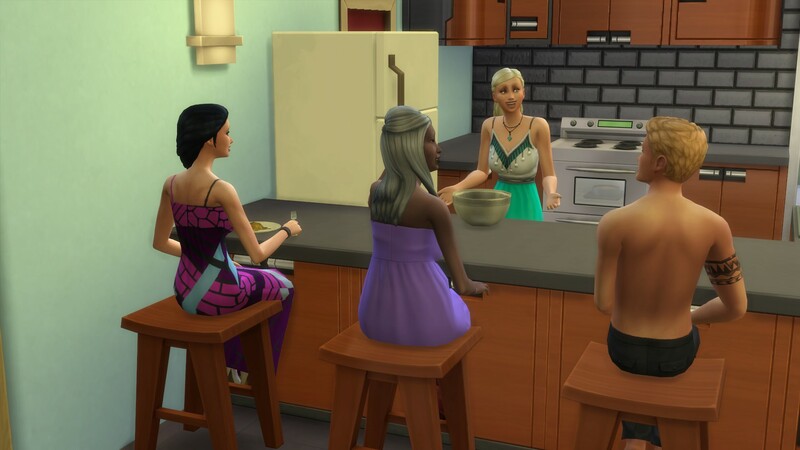 Usually my sims disperse all over the place when I have parties, so this time around I locked all of the bedrooms/office spaces to make sure they stay in the kitchen and living area. Works wonders! Lux: Haha gosh I know, there’s mot many “normal” family members at this point! 😀 Gives a whole new meaning to the term crazy family reunion! Your characters are so amazing. I can’t even choose who is my favourite. Cassiel is the real evil femme fatale, the twins are so cute in their own mischievous way, Daniel is… I don’t even have words for him. And then there’s Peter with his good heart and Lilah with her free spirit… I really really admire your work with these characters, they are the best! I have been quite fortunate in collecting a very eclectic mix of characters. But I don’t really do that much, I just let them guide me and tell their stories. he he he, I think Cassiel might my new favorite. We’ll see. Peter was really trying to sell that shirt lol. The Lollipop Guild turnt up at birthday party for a senior citizen. LOL Love it. I’ll be shocked if Cassiel ever admits her love for Baato. The Lollipop Lair gang love them some family parties haha! Yeah Cassiel would struggle with that. Heh – well, apparently I did read this far before, but I’m enjoying the writing and the antics just as much as before! I always struggle figuring out where I last left off when I’m revisiting stories after a while. And usually end up rereading parts by accident too, but I think it helps wi getting into what’s going on! Things I loved: Daniel watching Isaac sleep! Peter *really* wanting Baato to put on a shirt!! Haha just your average Bloomer family get together! I miss gen 3, they were all so cookoo haha!